Power lines and roofs battered Jump to media player Vanuatu, an island nation in the Pacific Ocean, has been battered by one of the most powerful storms ever recorded in the region. Vanuatu hit by Cyclone Pam Jump to media player Relief workers in the South Pacific say the archipelago of Vanuatu has been hit by winds of over 300km an hour. Cyclone Pam: 'My hotel is shaking' Jump to media player Unicef's Alice Clements describes the effect of Cyclone Pam on the city of Port Vila on Vanuatu. Vanuatu, an island nation in the Pacific Ocean, has been battered by one of the most powerful storms ever recorded in the region. 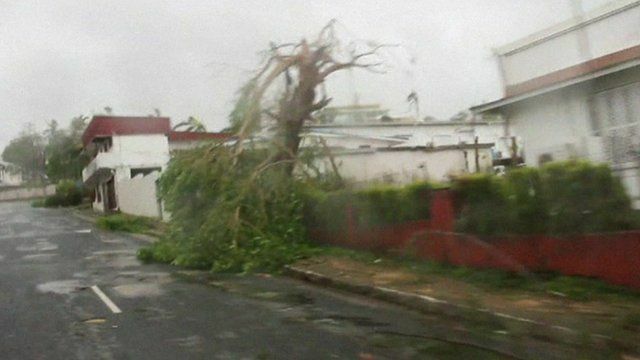 Cyclone Pam brought winds of up to 155mph (250kph), bringing done power lines and blowing off roofs. There are unconfirmed reports that 44 people have been killed. Phil Mercer reports from Sydney.